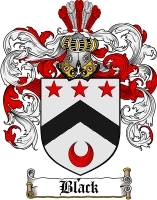 INSTANTLY DOWNLOAD the Black Family Crest / Black Coat of Arms. High Quality 300 dpi JPG file. Download it and use it freely to print for your own personal use. Use for Letterheads, Prints, Web Pages, etc. File is of much higher quality than the sample shown. Downloads in Seconds.